Say Buh-Bye to Bloating with These Tips! We all feel bloated from time to time, and it’s the most annoying sentiment in the world. It’s one of the reasons why I eat clean and workout every day. Even if you do abide by a healthy lifestyle, bloating can still happen. Fortunately for you, I have a couple of tricks to share! 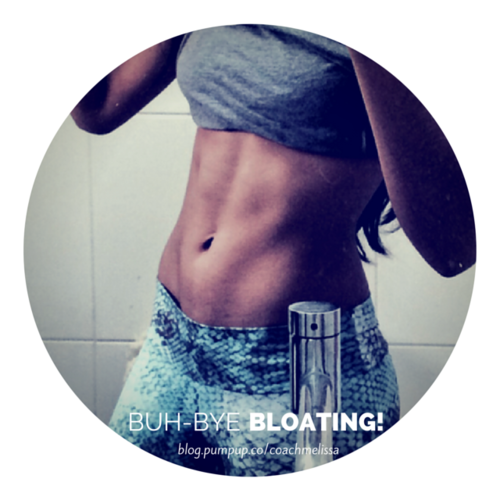 Say buh-bye to bloating and hello to gorgeous tips! 1.} Boosts the immune system: Lemon water stimulates brain & nerve functions. 2.} Balances pH: It reduces your body’s overall acidity (it’s one of the most alkalizing drinks!). Even though it’s acidic it metabolizes alkaline. Yay! 3.} Weight loss: Lemons help fight hunger cravings. Sold. 4.} Flush it out: Lemon juice gets rid of toxins. This helps with constipation & digestion. 5.} The best diuretic: Prep for your bikini season with lemon water! Lemons make you pee more, which rids toxins. 6.} Buh-bye pimples! : Vitamin C helps decrease wrinkles & blemishes. 7.} Rids bad breath: Because no one wants bad breath. 8.} Later, stress: Vitamin C is the first thing to go when you’re under pressure or stress. Bottoms up! Remember: not everything in life has to be so hard. This tip is easy. So make it an AM habit & thank me later. Note: eating too much lemons can eat away at tooth enamel. I highly suggest that you buy glass straws. Berries & grapes are easier on the digestive system. Dessert suggestion? Eat frozen berries & grapes! SO yummy! Pelligrino is the BEST!!! I drink it alllllll the time & it keeps me very full. BUT. It tends to cause bloat. So, add some lemon in your glass! Salt= major bloat!!! I use fresh herbs, lemon juice, or curry powder instead. Also, anything spicy can release stomach acid. So ( unfortunately ) stay away from spicy foods to prep for a bikini. Food allergies and intolerances can cause gas and bloating. Many people self-diagnose these conditions and unnecessarily eliminate healthy dairy and whole grains from their diet. You may benefit from reducing the amount of the suspected food or eating it with other foods. In the case of dairy, it can help to choose aged cheeses and yogurt, both of which are lower in lactose!! …And candy and other foods containing artificial sweeteners like sorbitol and aspartame, which aren’t digestible and trigger bloating.